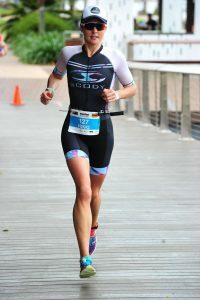 I had a great lead up, managing to get through months of training without injury, and a win at Busso 70.3 a month before was a nice last minute confidence boost. I’d been self-coaching and writing my own plan in training peaks since 70.3 Worlds in September last year. I’d taken all the valuable expertise I’d learnt from coach Alvin and adapted it to the long and slow race that is IM. The full distance presented a whole new challenge in pacing and reigning in the ego and I was excited and a little nervous to see how I’d go for my first one. A rolling start meant I would never know where my competition would be but also that I could never give up. My race plan was to be super conservative in the swim and on the bike as I’d never run a marathon before and had no idea how the body would hold up. The swim was tough and choppy but I actually quite enjoyed it and somehow managed 8th female overall out of the water. I settled in for the long haul on the 180km of awesome undulating bike course. Many times I had to let people go when they raced past me up the hills but I held my nerve and held my power, and just hoped I’d see them again on the run! While I was generally really comfortable for the whole bike leg, I’ve never been so pleased to start the most daunting part of the day…. I had a smile on my face for the whole first run lap, and I felt awesome. My biggest challenge at that point was to run slower! On the second lap I reached the ‘great unknown’ having never run more than 28km before. I tried to not focus on this and just worked on ticking off each km at a time. I could feel some tightness creeping into both quads and I started to worry I was heading towards a double leg cramp! This was when I started walking a few aid stations and hitting up the watermelon and electrolytes, and had a shot of some foul tasting but potentially effective ‘crampfix’. The tightness and pain never went away but the cramps didn’t eventuate either so I think it might have done its job. I started hanging out to see Aaron as my high spirits were slipping. When I saw him out there battling his head-cold and his demons I knew he wasn’t going to execute the race he was capable of, and it was up to me to do it for the team. It was a relief to pick up the third and final lap band, but they were such long laps! I was buoyed by the idea that I was coming to the end of the day, and as the sky got dark and I knew I was going to get it done. With 4km to go, I hit the final turn and was heading for home. I picked up the pace a little to finish it off. This was my biggest surprise of the day. My lowest point in 10hours – where I hit a rock hard brick wall – was at the 40km mark. I literally had nothing left. I expected the last 2km to be the most amazing experience, but I was done! So it was sheer relief that I finally dragged myself onto the carpet and down the finish chute! On reflection, I’m not disappointed that I didn’t get to have the most energetic finish line celebration because I think I nailed my pacing. I didn’t want to hit the wall at the 20km mark, and I didn’t want to leave anything in the tank. Despite hitting rock bottom, I had managed to hang on to my pace for dear life. Remember how I said never give up in a rolling start? Seven seconds was what separated me and the next girl. I’d caught her at km 41. So my final lesson of the day was that you have to just keep pushing because anything can happen in an Ironman! Cairns this year was near perfect conditions other than the chop in the swim and a bit of a headwind back into town. It was overcast, so not hot, and humidity was low. The scenery and spectator support were unlike any race I’ve ever done. I loved the rolling hills and winding roads of the bike course. I’d definitely recommend this for a racecation! And no, I didn’t take my Kona spot. That can be a challenge for another year! Nikki you truly are an inspiration, a pillar of strength and determination and living proof that we can all rise above the mundane to reach the magnificient. This race result was the culmination of all the hard work, training and commitment you have dedicated yourself to, since you were a young. May others follow in your footsteps, your wake and tyre tracks, but mostly, be inspired to be the best version of themselves.